Historical records indicate that Arnoglossum plantagineum (tuberous Indian-plantain) was not formerly rare in Minnesota but has suffered a recent decline paralleling the nearly total conversion of its prairie habitat. The once continuous population that apparently ranged throughout southern Minnesota has been greatly reduced. This pattern of habitat loss is repeated across the northern portion of its range and has caused concern for its survival in South Dakota, Minnesota, Iowa, Wisconsin, Michigan, Ohio, and Ontario. Compounding this problem are the natural demographics of the species. Arnoglossum plantagineum normally occurs in very low densities; most populations have less than five plants. Consequently, the small remnant habitats that survive today have preserved few individuals and may be incapable of supporting viable populations. Most of the surviving habitats for A. plantagineum are remnant prairie strips on railroad rights-of-way. For decades these prairies have been unavailable for agricultural use and persisted as native prairie. Railroad companies have been abandoning many rail lines in recent decades and selling the rights-of-way to adjacent landowners. Once sold, the rights-of-way are typically converted to crop production, which further reduces habitat availability. 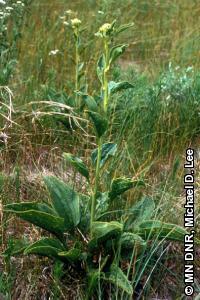 Arnoglossum plantagineum has been listed as a threatened species in Minnesota since 1984. Flowering individuals of A. plantagineum are quite distinctive. They possess a branched, flat-topped flowering cluster that is whitish in appearance. The heads are typically 5-flowered, and each flower is tubular and has both male and female parts. Stems are angled and grooved. Sterile individuals can be identified by the somewhat oval basal leaves that have long stalks with 5-7 nearly parallel veins. In Minnesota, this species is largely restricted to native, moist prairies in the southern portion of the state. A few populations are found on bluff prairies where the soil is dry. Many of these habitats are found on old railroad rights-of-way. A. plantagineum frequently occurs with other declining prairie species such as Asclepias sullivantii (Sullivant's milkweed) and Parthenium integrifolium (wild quinine). Arnoglossum plantagineum is a long-lived perennial that reproduces only by seeds. Flowers are pollinated by insects. A tuft of bristly hairs surrounds the ovoid, somewhat flattened seeds of A. plantagineum. As with many plants in the sunflower family, these bristles may be caught by the wind or latch onto passing animals, dispersing the seed to other locales (Great Plains Flora Association 1986; Voss 1996). The continuing loss of native, undisturbed prairie is the greatest threat to this plant. Some sites that formerly harbored A. plantagineum have been plowed quite recently. Herbicide drift from neighboring farm fields is a potential threat. Prescribed fire may be beneficial but only if carefully timed; it should be confined to the dormant season in early spring. Increased herbicide use by railroads for right-of-way management is an emerging threat. The best time to search for A. plantagineum is when flowering, from June through August. Several populations of this species occur on public land and are adequately protected from land conversion. However, these populations need careful management to persist, and could suffer if conditions within their habitats deteriorate.